Our property managers are business people working in partnership with you to achieve your goals. We tailor the management of each property based on the specific goals and priorities of our clients. Focused on driving value, we work to minimize operating costs, maximizing efficiency and tenant services, and protecting the value of each asset. We coordinate a myriad of vendors to attend to a building’s physical recurring problem and how to do it cost effectively. We have a network of qualified vendors to choose from who are familiar with our processes and can often be another set of eyes on your property. 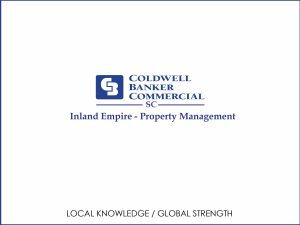 Coldwell Banker Commercial SC boasts a Property Management Division that offers local market expertise that is backed by the largest real estate company in the world. We have 3 southern California locations: Temecula, Ontario, and San Diego with a proven tract record of Property Management services. We manage properties for national institutional level clients and private owners alike. We have the ability to customize our services to fit the specific needs of each client. The Coldwell Banker Commercial Property Accounting team employs a prompt accurate, and proactive approach to property management. The team is well-versed in commercial and association accounting responsibilities, utilizing the latest Yardi based software programs to provide a seamless integration with property management reporting. Property inspections are an important aspect of any asset services offering. We proactively conduct routine interior and exterior inspections of our clients’ properties in accordance with the terms of the management agreement. During inspections, our property management team notes preventative maintenance items and observes vendor performance, adjusting accordingly to preserve the daily functions and property aesthetics. Notes are then put into a punch list for remedy. It is our policy to provide prompt response to all work order requests. We also take pride in tracking and producing owner reports while taking the proper steps to make sure all of our vendors are licensed and insured. By doing this, we ensure the safety of tenants and preserve the property condition.